This type of sesame oil press is practically designed to expel sesame seed. 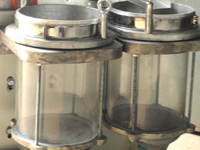 The sesame oil press is of compact structure, it is light and easy to operate. It can automatically expel and filter the oil simultaneously, with a high rate of sesame oil production and greater oil yield. Our sesame oil press is perfect for mobile operations such as at a vegetable market, a supermarket, a bazaar in the countryside, or even at home. The residue can be used as fertilizer or forage.All parts of the sesame oil express can be dismantled, installed, and maintained easily. 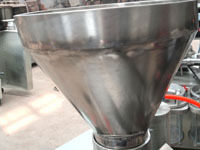 Raw material quantities of 0.2-0.4kg are allowed to be fed into the oil press when the press is hot. 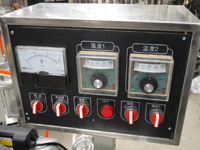 Usually, there are four main parts in the integrated sesame oil press, they are oil press, filter press, hooper and electrical cabinet. 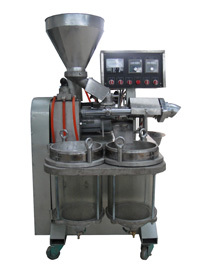 Below are some main parts in the sesame oil press machine. In the sequence of hooper, electrical carbinet and oil filter. Quality guarantee term is for one year. Any broken which are caused by machine-self and quality will be responsible for our manufacturer. Others which are caused by operation mistakes, man-made problems, etc will be responsible for clients-self. For quantity more than five units of our new type YZS series sesame oil press machines or large quantity, we can give you discount in different degree. If you have any question or advice, pls feel free to contact us without any hesitation.